Newport's Max Porter says he considered retiring from football during his long struggle to overcome a groin injury. 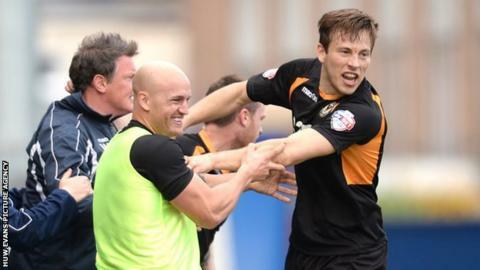 The 26-year-old midfielder scored his first goal in over a year in the Exiles 1-1 draw at Chesterfield. Porter had two operations and says manager Justin Edinburgh's advice was key after he had been advised to quit. "There was a point when I sat down with Justin and he said go to [FA National Football Centre] St George's Park and see what they say," he said. "Going up to St George's Park saved me. "The guy up there had suffered the same problem and really helped me. "And Adam [Newport physio Adam Roach] arrived at the club and from that point I've just got stronger and stronger." Porter's problems started when he was injured in January 2013. He made an abortive comeback in the summer of 2013 which lasted only two games before the injury flared-up again. Porter made his comeback in January this year, but will have to stick to a special fitness regime for the rest of his career - an inconvenience he says he is happy to endure. "The low point was when the surgeon told me to retire," said Porter. "You lose a lot of confidence and self belief when you're watching from the sides. "When you're struggling to get out of bed after surgery you wonder if you'll ever play football again or if you'll ever get back to that level." Newport - currently 14th in League Two - are back in action on Tuesday when Plymouth visit Rodney Parade. The Exiles have not won at home since the 3-2 success over Oxford on 18 February, and Porter says they have to end that run quickly. "We need to get back to winning ways now, especially at home," he said. "If we can get a win at home [we] can enjoy the end of the season and see where it takes us."